Independent jewellery store Jude is the perfect place to shop for quality fashion jewellery, accessories and gifts. If you are looking for something special, keep it local at this fab new store! Big birthdays, weddings, Christmas presents for friends, mums and sisters…a well-earned treat for yourself…there is always a good excuse to go shopping for gorgeous things! Now you don't have to drive into town or battle through a busy shopping centre to find quality gifts and accessories. A new shop selling everything you need to set off that special outfit, or solve your gift dilemma, has opened on Carshalton High Street. Run by super-friendly and helpful Julie and Debbie, Jude�sources quality costume and fashion accessories that are really stunning without being prohibitively expensive. "We are a small friendly shop run by two best friends," explain owners Julie and Debbie, who have been trading since 2010. "We both share the same passion for costume jewellery and fashion. The name 'Jude' originates from the first two initials of our names." Julie and Debbie set out by doing jewellery parties. After being very successful they were able to open a small retail unit in Tooting Market. "It was here that we gained our reputation for exceptional customer service," says Debbie. In June 2012 Julie and Debbie ventured into their first shop in the heart of Carshalton where they continue to source creative and unique products. "We love what we do," adds Julie. "Our aim is to be best in the industry." "It's so lovely to be able to shop for quality accessories on Carshalton High Street!" said Carshalton Mum Kate. "The ladies that own the shop are so friendly, it's a real pleasure popping in and having a browse around. They really make you feel welcome and are great with my kids too!" "I bought a fab apple scarf from Jude�- I love it!" added Carshalton Mum Beka Cohen. 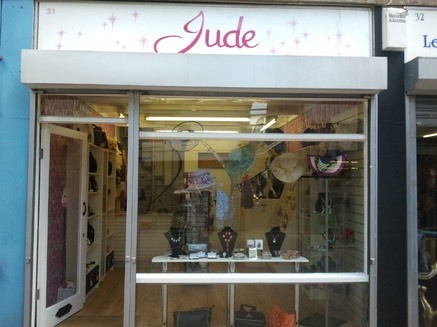 So if you are looking for a special gift or need a stunning accessory for a big occasion, why not give the big town centre a miss and check out Jude�instead? A fab local store on our doorstep! Local Mums are receiving a 10% discount too! (Just mention Local Mums or Carshalton Mums). Includes: Leather bag �40.00, Glass Box �12.00, Necklace and Earring Set �16.00, Christmas cards �4.00, Handbag Hook �10.00, Scarf �9.00. Tickets are now on sale �2.00. Orders can be placed on their Facebook page or on their website with payments made via paypal.